Andersen, Laura. The Boleyn King . Ballantine 2013. 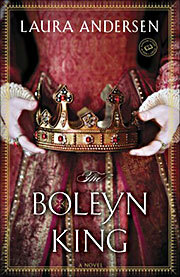 What if: Anne Boleyn did not miscarry in early 1536 but bore a healthy son to Henry VIII that June. 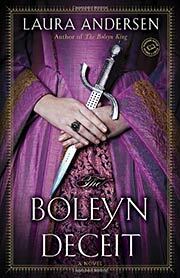 Series note: Series beginning with the trilogy of The Boleyn King , The Boleyn Deceit , and The Boleyn Reckoning , and continuing with a follow-up trilogy of The Virgin's Daughter , The Virgin's Spy , and The Virgin's War . Summary: Young King Henry IX of England falls in love with a commoner orphan. Series note: First in the Tudor Legacy series. Published: Ballantine 2013 (0345534093w88 android). Andersen, Laura. The Boleyn Deceit . Ballantine 2013. Summary: The regency ended, Henry IX assumes full power as king of England. Series note: Second in the Tudor Legacy series. Summary: Princess Elizabeth assembles a shadow court as her brother, King Henry IX of England, leads the country toward civil war. Series note: Third in the Tudor Legacy series. Andersen, Laura. The Virgin's Daughter . Ballantine 2015. Summary: Dynastic maneuverings about Anne Isabella, only child of Elizabeth of England and Philip of Spain. Series note: Fourth of the Tudor Legacy series, and first of the second trilogy in that series. Series note: Fifth of the Tudor Legacy series, and second of the second trilogy in that series. Published: Ballantine 2015 (0804179387w88 androidBUY). Series note: Sixth of the Tudor Legacy series, and third of the second trilogy in that series.